Acting defensively is essential in today's lawsuit-prone world where careful planning to shelter assets is a necessity. But very few individuals actually undertake proper Asset Protection and are highly exposed to the risk of loss from a wide variety of legal actions. Our job as legal advisors is to protect our clients from the threat of asset loss resulting from lawsuits, foreclosures, creditor actions, ex-spouses, relatives, children and others that exploit our legal system for personal gain. In our years of practice, we have helped thousands of clients in the design of highly effective strategies to protect their wealth and provide comprehensive advisory services to individuals and businesses. The key to successful Asset Protection is to implement a plan before legal action is taken against you. Self-defensive measures that are properly executed can prevent assets and wealth from being claimed by others or attacked in a court of law. A wide range of Asset Protection options are available, but each must be precisely initiated to be effective and deliver their intended benefits—as well as the peace of mind in knowing that you have taken every step to protect your hard-earned assets. Everyone—whether you are wealthy or have very few assets. Even if you believe you have your assets protected you should constantly review your protection plan. Anyone who might be exposed to a lawsuit or litigation. Advisors that wish to shield their client's wealth. Professional practitioners that need to protect their business and personal assets. Entrepreneurs that are just starting out and want to protect their future assets. Retirees that wish to shelter their nest egg or preserve wealth as inheritance for their families. Anyone exposed to the unscrupulous actions of lawsuit-obsessed individuals, creditors, foreclosure deficiencies, ex-spouses, children and grandchildren and others that have the potential to compel a court to dismantle your assets. 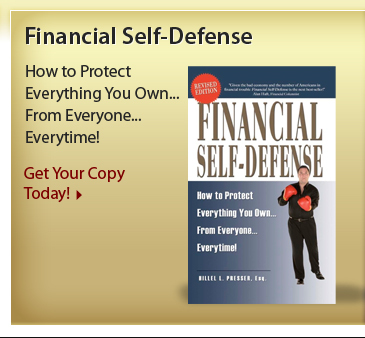 A broad range of tactics and strategies that will protect your assets. Tips to preserve your wealth. Simple facts and honest answers about Asset Protection—without complex legal wording that only a lawyer could understand. The most common mistakes made by unprotected citizens.